4pk Oregon Finish Blade Swisher T-44 44 Deck Finish Trailmowers 9005 9036 B32S. 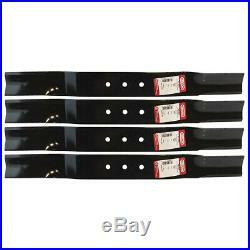 Set of 4 Oregon Finish Blade Replaces OEM Part Numbers: Swisher 9005, 9036, B32S. Genuine Oregon Product Replaces OEM Part Numbers: Swisher 9005, 9036, B32S. Fits: Swisher T-44 44 Deck Finish Cut Trailmowers. Requires 2 blades for 44 deck. Superior mulching for bagging and discharge efficiency. 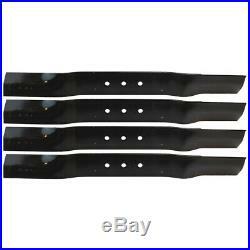 The item "4pk Oregon Finish Blade Swisher T-44 44 Deck Finish Trailmowers 9005 9036 B32S" is in sale since Tuesday, March 19, 2019. This item is in the category "Home & Garden\Yard, Garden & Outdoor Living\Lawn Mowers\Lawn Mower Parts & Accessories". The seller is "fix_my_toys" and is located in New Baltimore, Michigan.